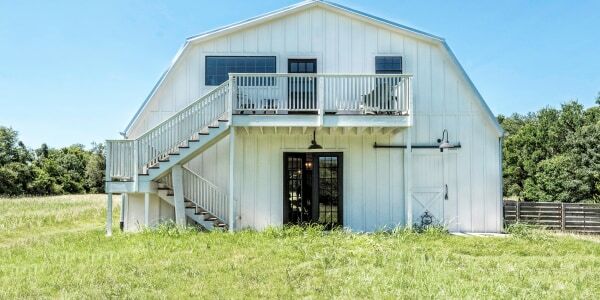 You can now own a 'Fixer Upper' home — this one from Season 4 is for sale! Want a house with the Chip-and-Joanna-Gaines touch but don’t want to go through the lengthy renovation process? Well, you’re in luck, because there’s a house on the market that was designed by the home improvement duo on Season 4 of "Fixer Upper." You might remember the episode featuring Matt and Melissa Yeilding who dreamed of owning a home with an open floor plan, but settled on a 1950s ranch with a wall separating the living room and kitchen. The three bedroom, two bathroom house, which got the name "The Plain Gray Ranch,” was transformed into a light and airy space with the open concept living area the couple was hoping for. On "demo day," the wall between the kitchen and living room was knocked down to make the space roomy and flooded with light. They also added two sets of French doors around the fireplace which allows even more natural sunlight into the space. The crisp white kitchen features a neutral tile backsplash, new appliances, farmhouse sink (a Gaines favorite) and floor-to-ceiling cabinets. There’s also a dining table with custom-made bench seating that backs up to the large island. One of the biggest challenges of the renovation was transforming the tiny master bathroom into a larger space. To do this, the Gaineses relocated the water heater and HVAC unit so that they could expand the bathroom into the service closet next door. The result is a large space complete with a double vanity. The couple originally bought the house for $135,000 and spent $60,000 on renovations. The house is currently on the market for $310,000. One of the home made over by Chip and Joanna Gaines on "Fixer Upper" is on the market! Take a tour. See more pictures and the full listing at Magnolia Realty.